The Fall Plenary session will take place on November 13-15, 2014 at Irvine Marriott Hotel. Early registration is open now through October 29, 2014. 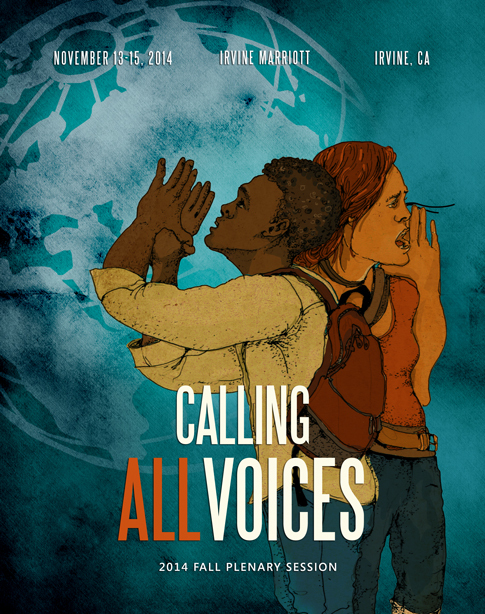 The theme of this session is "Calling all Voices". The ASCCC Fall 2014 Plenary Session will be held at the Marriott Hotel in Irvine from November 13-15, 2014. Registration for the event is now open. Scroll down to register online. The theme of this plenary session, “Calling All Voices,” reflects both the important work being done by the Academic Senate and throughout the system regarding equity and diversity and the ASCCC’s commitment to including and honoring the many diverse and divergent voices and points of view of the faculty we represent throughout the California Community Colleges. We hope that as many of you as possible will join us in Irvine for the Fall Plenary Session. Payment in full is required prior to attending the event. Attendees that registered before October 29th must pay before October 29th in order to secure the early registration rate. Call our office at (916) 445-4753 with questions. The cancellation deadline for a full refund is October 29, 2014. Please review the Senate Cancellation Policy here. Any request for refunds received after October 29, 2014 will be reviewed by the Executive Director. Please keep in mind that registrations are transferable. All cancellations are subject to a $50 processing fee. Call Tonya Davis, Office Manager, at (916) 445-4753 x 106 with any payment questions. The ASCCC group rate is $132+tax per night for singles/doubles. This rate includes guest room internet and discounted parking. Rooms must be booked before Wednesday, October 22, 2014 to secure the group rate. The rate, based on availability, is offered three days before and after this event. Call Marriott Reservations at (800) 228-9290 or the hotel directly at (949) 553-0100 and ask for the Academic Senate group rate. For your convenience, an online registration link is also provided to reserve your room today. We have secured three types of rooming options to fit your needs. Our room block at the Irive Marriott is close to selling out! Below is a list of nearby hotels. Please note that a room block has not been established at the listed hotels. The Irvine, CA Marriott Hotel is located in the heart of Orange County and just minutes from Newport Beach and Huntington Beach. Guests can take advantage of world-class indoor and outdoor shopping at nearby Irvine Spectrum, South Coast Plaza and Fashion Island. There are three airports close to the Irvine Marriott - John Wayne, Long Beach and LAX. For those flying into John Wayne Airport-Orange County, the Marriott's complimentary shuttle service will bring you to the Marriott door within minutes. Click here to view transportation options and driving directions to the Irvine Marriott. Session registrants will receive a discounted rate of $8 per day at the Irvine Marriott. For day drivers, ask for parking validation daily at the Academic Senate Registration desk. For guests staying at the hotel, please advise the Front Desk staff that you are an overnight guest to receive validation that will give you in and out privileges for the entire stay. Please note that the parking structures adjacent to the hotel DO NOT honor Marriott’s parking prices. Hotel guests will enjoy complementary WiFi in their sleeping rooms. All other attendees can access the WiFi in the hotel’s main lobby. Disciplines List Revision Hearing Materials. Click here for CCC Confer Participant Instructions. 1. I’m New – Now What? 5. Relations with Local Senates: What have you done for me lately? 2. Thriving through Sanctions, “Thank you, sir may I have another?” I have sanctions, now what?